Since human civilization began, states, nations and religions have settled their differences with war. They were essentially battles between men seeking change and men defending the status quo. The confrontations continue to this day with leaders demanding support from their members on every rule they make. The power of the men who lead the confrontations seems, however, to be slipping. In "The Post-Man: Charting the final, exhausted collapse of the adult white male, from Huck Finn to 'Mad Men'" (New York Times Magazine, Sept. 14, 2014) film critic A.O. Scott describes the succession of literature, movies and TV shows depicting the collapse of men's superiority--an old power structure both built by and serving high ranking white men. Scott traces how many American heroes have been young men on the run, refusing adulthood, and refusing to accept marriage and responsibility by rejecting stereo-typed "good" women. After Scott laments no one knows how to be an adult anymore, he explores how men's identity crisis is affected by a force out of men's control: the rise of women breaking out of their stereotyped roles. Dov Seidman, who wrote How: Why How We Do Anything Means Everything, (Wiley; Expanded edition September 21, 2011) speaks of the changes in the business world today that are collapsing the old corporate structure of the hierarchy, which was designed for top down management to make decisions on information passed up the corporate ladder. With the high growth in communications technology providing both that information to everyone on the World Wide Web, plus the ability to talk to anyone anywhere, Seidman says there is a shift going on from the power of command-and-control hierarchies to the power of collaborative, horizontal effort. "More profoundly than just getting things done. . . relationships lie at the heart of who we are. The free flow of information encourages trust and collaboration and creates a dangerous playing field for those whose game is to shade the truth." Seidman says behavior is shifting from rules-based to appropriate actions that build trust. Family structures are transforming, too. Today, less than half of American households are married couples. My father's role in our family when I grew up was sole breadwinner. He was strong, silent, and made all family decisions. But to participate in today's evolving world, we men are called to communicate and sell ourselves better at work and at home. For some of us, like me, forming better, more trusting relationships is a learning curve. I spent my whole corporate career being like Dad, very competitive with co-workers, trusting only a handful of people, and not disagreeing with superiors. Men's groups across the country are teaching men to see how they are following, or not, in their father's footsteps, to recognize and handle their emotions, and to become more transparent talking about their life and relationships. One workshop at The Cenacle Retreat House in Houston, "A Walking Tour of Male Spirituality," offers a safe place for men to practice talking about themselves without being challenged or "fixed," and, listening to other men. Their next workshop begins January 22, 2015, and meets weekly at 7:00 pm for ten weeks. 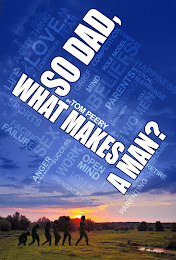 The Tour is based on the life issues raised in my book, So Dad, What Makes a Man? A Narrative on the Male Identity. I am co-facilitating with Lloyd Guerin and Luis Canales. (ministry@cenacleretreathouse.org).